“This is one of the disadvantages of wine, it makes a man mistake words for thoughts.”—Dr. Johnson. “The powers of conception and judgment are from the beginning distinctly affected, although he who takes the alcohol is quite unconscious that it has this effect. The actual facts are exactly the opposite to the popular belief. I must confess that my own experiments, extending over more than ten years, and the theoretical deductions therefrom, have made me an opponent of alcohol.”—Kraepelin. “ Alcohol perverts the moral nature, affects the judgment, and impairs the memory ; it moreover especially affects the motor system, and creates an enormous loss to the community through destroying the productiveness of the skilled craftsman.” — Evidence given by Dr. Robert Jones, F.R.C.S., before the Inter - Departmental Committee on Physical Deterioration, 1903. “A man under the influence of small quantities of alcohol has no right to believe his own senses. He cannot trust them to give him correct facts, and he cannot rely upon his judgment for the interpretation of facts. ”—Prof. Sims-Woodhead, M.D., etc. “O that men should put an enemy in their mouths to steal away their brains ! that we should, with joy, pleasance, revel and applause, transform ourselves into beasts ! “—Shakespeare. The effects which alcohol produces on the working activity of the nervous system may perhaps be best arranged according to the scientific investigations which have been carried out as regards the changes it causes in the intellect, the emotions, the motor mechanism, and the functions of the cerebellum. psychical functions of the brain. 66 ALCOHOL AND THE HUMAN BODY chap. the effect of small or moderate quantities only, since the disastrous result of large doses is too well known to require very full description, and too catastrophic to admit of minute analysis. At the same time we must not pass unnoticed the chief features, however trite and notorious, of the nerve symptoms which result from (1) subacute, and (2) severe alcoholic poisoning, respectively. 1. Subacute Alcoholism.—Persons who with singular un­ truth are said to “ do themselves well,” or who habitually take alcohol between meals, gradually develop nerve changes which reveal themselves at first by loss of energy or lessened capacity for business and diminished attention to detail. Intellectually the brain failure also evinces itself by dulness, stupidity, and unreasonable errors. Such changes, which are due to the slow poisoning of the highest cerebral centres, are practically never attributed to the real cause; but, when recognised in time, the better-ment which ensues on the adoption of total abstinence from alcohol is very striking. If the alcohol habit is maintained, then the cerebral deterioration increases, and may become so established that the subject may entirely lose all power to abstain. 1 G. W. Ewens, Insanity in India. 2 Ibid. a marked way—querulousness, emotional irritability, and un­ reliability being the prevailing characteristics. As the years go by a certain number of these patients slowly develop a state of chronic alcoholic dementia, which will be described in the next chapter. It is pointed out by Dr. F. Hare, the medical superintendent of Norwood Sanatorium, that the chronic inebriate has almost always been a “moderate drinker” in the beginning of his career. 2. Severe Alcoholism.—If a large dose of alcohol is taken at one sitting, i.e. within two to four hours, the symptoms referable to the nervous system are such as are commonly spoken of as drunkenness or intoxication, and the stages of exhilaration followed by brain failure and collapse occur in more or less rapid sequence. The person becomes for a short time “ conversational” ; he talks freely, and more or less at random, appearing to himself and to any friends, who may be in the same stage of poisoning, to be “brilliant,” whereas his thoughts are really superficial. This so-called stage of stimula­ tion develops into noisiness and emotional excitement as the cerebral control becomes increasingly paralysed. The next change is the commencement of narcosis, and dulness and heaviness succeed. If sleep does not prevent the taking of more alcohol, then serious unconsciousness and even coma may suddenly supervene. Vomiting, however, often sets in at the commencement of the drowsy stage, and by this method some of the excess of alcohol is excreted. If not, and the coma becomes profound, the centres of organic life, i.e. of respiration and circulation, become affected, and death may ensue. A demonstration of this is occasionally seen when a man swallows the contents of a bottle of whisky for a wager. He is observed to sink quickly into a state of unconsciousness, all intellectual action being completely in abeyance. Generally the patient can be slightly roused, the contents of the stomach pumped out, and his life saved ; but sometimes the coma deepens and death takes place, owing to a paralysis of the nerve centres so profound that the most active measures are of no avail. 68 ALCOHOL AND THE HUMAN BODY chap. It is indeed so obvious to even the untrained eye that mental weakness and not mental vigour is the result of large doses of alcohol that we will not labour this point, but proceed at once to the part of the subject which, before it could be fully understood, required exhaustive scientific investigation, namely, the effect of small doses of alcohol upon brain activity. The researches of experimental physiology during the last twenty years into the functions of the brain have now com­ pleted in a logical manner our knowledge and analysis of the effect of moderate and small doses of alcohol on those of its centres which form the material basis or machinery of in­ tellectual ideas. It is clear that in order to investigate the action of alcohol on such a complex process as that involved in mental action we must first start from elementary facts. Of such facts or principles the most elementary is the generalisation that alcohol and similar drugs attack the more complex living structures and functions before the simpler. That this is a fundamental law in nature is interestingly shown by such observations as those of Overton, who found that when he placed various forms of lowly organisms in the same per­ centage surrounding of alcohol, those which exhibited the most complex active movements were the first to be depressed, whilst it was only at a later period that the gradual toxic in­ fluence of the alcohol abolished the activity of the lowest forms. centres and functions, only later overwhelming those of organic life. To apply the method to the nervous system direct, we begin by giving the brain, when unstimulated, some exceedingly simple task to perform, and then make it repeat this same task after a dose of alcohol has been administered. The activity of the brain in performing any function can be estimated by either measuring the relative times it takes to do some small task allotted to it, under these two conditions re­ spectively, or by estimating the amount of work done in a given time, under the same two conditions, employing long periods to avoid errors. Research on this subject has been chiefly carried out by Professor Kraepelin and his psychological school at Heidelberg, and what he has accomplished is so valuable that it has given him a pre-eminent position of authority on the subject. The investigations have been con­ tinued for many years, partly because every new test had to be repeated many times in order that correct averages might be arrived at. The amount of alcohol given at a dose varied, of course, but as a rule it amounted to about an ounce diluted with water. Thus it is that Kraepelin’s work is so important, since his results were the outcome of small doses of alcohol which, in quantity, in fact, were often far below the amount fre­ quently taken at meals by ordinary individuals, and not infrequently termed a “ dietetic “ amount. 70 ALCOHOL AND THE HUMAN BODY chap. responsive movement, all that is necessary is to exclude by subtraction the time occupied in mere transmission along the nerves, and in that way obtain the true time spent by the centres of the brain and spinal cord in appreciating the sensory impulse and acting upon it. This method has been employed by numerous investigators, but by none with more complete­ ness than by Professor Kraepelin, who has thus been enabled to harmonise the apparently contradictory results arrived at by previous observers—a good proof of the controlling and critical value of his researches. Kraepelin found that the simple reaction period, by which is meant the time occupied in making a mere response to a signal, as, for instance, to the sudden appearance of a flag, was, after the ingestion of a small quantity of alcohol (¼ to ½ ounce), slightly accelerated ; that there was, in fact, a slight shortening of the time, as though the brain were enabled to operate more quickly than before. But he found that after a few minutes, in most cases, a slowing of mental action began, becoming more and more marked, and enduring as long as the alcohol was in active operation in the body, i.e. four to five hours. In another series of experiments, made before and after the taking of doses of alcohol (averaging as a rule about an ounce) diluted with water, Kraepelin measured the speed with which the processes of simple reading aloud, adding figures in columns both up, down, and also across, calculating arithmeti­ cally, etc., were performed. The ability to memorise was also tested. All the circumstances which could have any influence on the result were taken into consideration and allowed for in every experiment. example of an almost mechanical motor action ; and it is these motor actions that he found to be facilitated at first, especially by small doses ; whereas the more involved processes of adding figures rapidly, or of doing mental arithmetic, were not facilitated by taking alcohol, but the reverse. As an example, we may give the outlines of one experiment. Half an hour daily for six days was utilised in adding figures, without any alcohol having been taken. The ability to add increased, of course, every day. On the seventh day the experiments were begun under the influence of alcohol. In spite of the influence of the previous days’ practice, the capability of adding did not increase ; but instead it began to decrease very rapidly. On the nineteenth day the use of alcohol was stopped, and immediately an improvement mani­ fested itself ; but on the twenty-sixth day, when the use of alcohol was resumed, a decided decrease in the power of adding figures again manifested itself. With regard to the function of memory, alcohol in these doses was discovered by Kraepelin to be distinctly hampering. Various tests were made as to the power of remembering words or numbers. For instance, persons were set to memorise numbers which were written in columns, and required to be repeated again and again until they could be repeated correctly once. It was found that without alcohol 100 figures could be remembered correctly after 40 repetitions, while under the influence of alcohol only 60 figures could be remembered even after 60 repetitions. These experiments are confirmed by the experiences of daily life, which show that in the alcoholic person memory is exercised with much greater difficulty than in normal persons. It must be remembered that memory is one of the later acquisitions of mind, and according to the rule that the latest and most recent faculties of mind are the first to vanish under the stress of poisoning or illness or advancing age, it is but natural for alcohol to cause this early failure. The untruthfulness and inexactitude of those who take alcohol is frequently due not so much to a wilful determination to lie, as to a vague inability to recall accurately events, facts, and promises, for the very reason that alcohol has prevented the cells, upon the activity of which memory depends, from recording normally vivid and exact impressions. 72 ALCOHOL AND THE HUMAN BODY chap. (b) Effects of small Quantities of Alcohol on the more highly specialised Functions of Ideation, Reasoning, etc. When, on the other hand, the higher powers of the mind, i.e. those involving association of ideas and the formation of judgments, were called into play, Kraepelin found that there was no real quickening of brain activity under alcohol, but that its slowing effect upon the brain began from the first and continued throughout. As a simple example we may mention an experiment in which he tested the effect of alcohol on the association of ideas, and the memory of these associations. Words of all kinds, representing objects, ideas, sounds, etc., were printed in bold type and presented to the subject, who had to name some noun which the presented word called up in his mind, and which was associated in his thought with the presented word. An instrument of excellent device flashed the card up into sight, and then recorded the moment at which the lips spoke the associated word. During a series of consecutive days at the same hour the experimenter read these words successively, and in the same order, to the subject under experiment, and noted the idea that the word suggested. When at the end of several days the associations were fixed in the mind—when the length of time necessary for the product had reached its minimum— Kraepelin repeated the experiment, sometimes after the ingestion of alcohol, at other times fasting, and compared the associations produced. He distinguished two kinds of associations—inferior and superior. Inferior associations are due, for instance, to mere sound of words, as gendarme, salle d’armes ; or they indicate co­existence in space or time, e.g. horse, girth ; noise, smoke of cannon. Superior associations, on the other hand, involve a mental comparison or judgment, or the expression of a quality. Frequent variations of this method of experiment all tend to prove that alcohol both delays the rapidity of cerebral association and also alters its quality. It favours the production of inferior kinds of mental association, and cuts off higher associations. Hence the operation of the highest function of the brain is interfered with. In other words, small doses of alcohol, from the very first, influence adversely the finer brain cells and centres of latest and highest intellectual development. 1 Praktische Arbeit unter Alkoholwirkung, von Gustav Aschaffenburg— Psychologische Arbeiten, von Emil Krapelin, Erste Band, p. 608.
volitionary work, forms an excellent practical example of the influence of alcohol upon brain activity. It occurred to Dr. Aschaffenburg to choose for his experi­ ments the work of compositors, which involves rapid thought and accurate muscle response. At his suggestion four men offered themselves for the research. They were all skilled artisans, three of them accustomed to drink moderate (“ dietetic”) quantities of alcohol, and a fourth who was known to drink to excess occasionally. Small intervals of time were taken, and the total number of letters composed was first observed under circumstances of normal condition, from which the necessary preliminary averages and observations of fatigue-effects were obtained. The nature of the result is shown very clearly in the accompanying table (Fig. 14), which gives in four groups the relative figures for the number of letters set up on four successive days in four quarters of an hour by these four men. On the first and third day they had no alcohol, and their work is represented by the solid black columns. On the second and fourth days they had a small dietetic quantity of alcohol, and the dotted columns in the table represent the number of letters composed by each compositor after he had had this dose. The plain skeleton outline which projects beyond each solid column represents what the same man was calculated to be able to do in the time allotted for the test. Thus in the case of the first man—on the first day he might have been expected to set up 2390 letters, whereas he set up 2339, i.e. 51 less. On the second day, owing to the effect of practice, he might have been expected to set up 2554 letters, whereas he only set up 2212, or 342 less. Here the impairment of mental activity caused by alcohol is well shown. Thus we see that the actual loss of working power was 8·7 per cent (15·2 minus 6·5). Fig. 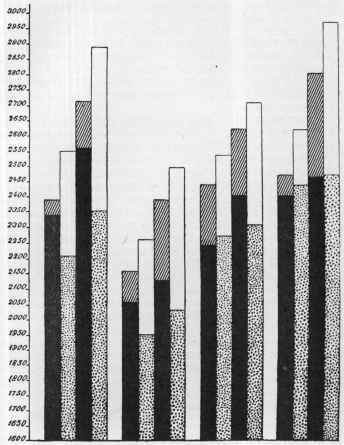 14.—Diagram copied from Dr. Aschaffenburg, showing the influence of alcohol in affecting the number of letters set up by compositors. The skeleton outline at the head of each column shows what each man was expected to accomplish. The propor­ tion of non-achievement, i.e. inefficiency caused by the alcohol, is striking. they were doing better and quicker work when taking alcohol than when abstaining, although the actual facts were the reverse. This, of course, is the constant delusion which occurs as a result of the action of most narcotic drugs (see p. 80). The results obtained by these two observers obviously con­ firm those of Kraepelin. 2 An everyday example of this error in judgment is shown in failure to recognise when to stop taking alcohol. A man who has taken one glass of beer is to that extent less competent to judge whether he ought to take another. 76 ALCOHOL AND THE HUMAN BODY chap. “ Frequently they slyly enter the mind without one’s immediately attaching any importance to them ; later some very simple accident or circumstance may be sufficient to reveal to us, when and under what circumstances they arose, or they may be present without our even know­ ing from whence they came. At other times they come to us suddenly, without any exertion whatever, just as an inspiration. As far as my experience is concerned, they never come to a wearied brain, or at the writing-desk: they were especially inclined to appear to me while indulging in a quiet walk in the sunshine or over the forest-clad mountains, but the smallest quantity of alcohol seemed to scare them away ” (“die kleinsten Mengen alkoholischen Getränke aber schienen sie zu verscheuchen ”). This limitation of the range of thought by alcohol is a matter of common interest, because it is observed constantly in daily life. For instance, when alcohol has been taken, any mental effort which necessitates the rapid recalling of an event or of an abstract ideal or thought becomes often slightly more difficult. Ordinary uninteresting conversation along routine lines can still be carried on, although the brain is in that slightly paralysed state in which the strictly accurate com­ prehension of broad facts and their bearings is impossible. Persons in this condition rarely make really instructive con­ versationists, because their powers of mental association are not fully available, owing to the partial inaction of their higher brain centres. 1 T. Claye Shaw, M.D., F.R.C.P., “Psychology of the Alcoholic,” art. in The Drink Problem, 1907.
factor when evidence is required in courts of law, because the testimony, although bona fide, may be unreliable. Comparatively slight numbing of the higher mental faculties often proves to be a matter of grave importance when the lives of others are at stake. Extremely serious, for instance, are those wrong decisions and wrong orders given on board ship or before a battle, when everything depends on the absolute reliability of the brain in command. It must be remembered that, as a rule, only those behind the scenes are possessed of information sufficient to decide whether or no any given disaster can be attributed to the action of alcohol, and even then expert knowledge of the action of drugs on different persons is essential before a correct estimate of the situation can be arrived at. Too often this element in the case is ignored. The number of accidents which come under this heading is simply appalling. Many are due to the irritant action of alcohol, which leads men and women to attack and injure other human beings. Numberless other accidents are the result of falls, miscalculations as to distance when moving about amongst machinery, unsteadiness of gait, shakiness of arm and hand, etc.—all these being due to the depressing and poisonous effect of alcohol upon the brain and the nervous system generally. This makes the average total for Saturday and Saturday night 10·26, i.e. nearly double the daily average of accidents throughout the week. 1 There has been Sunday closing in Scotland for fifty years. 78 ALCOHOL AND THE HUMAN BODY chap. Between 6 p.m. on Saturday and 6 a.m. on Sunday the average was 6·08, whereas between the same hours from Sunday to Monday the average was less than 1 (i.e. ·9 per cent). Injuries to the head occurred four times as frequently on Saturday nights as on ordinary nights, and on Sundays there were practically none. In another group of cases the surgical accidents are clearly traceable to mental inertia in alcoholic parents, which leads to the neglect of children, who consequently scald and burn them­ selves in a terrible way. Again, innumerable accidents are due to nothing else but mental stupidity and slowness on the part of persons who normally have “their wits about them,” but who, in con­ sequence of taking alcohol, do not quickly enough grasp the bearings of a situation, with the result that an accident occurs. In Belgium it is calculated that 43 per cent of the accidents in mines and factories are due to alcohol. In America (although the amount of alcohol used on that side of the Atlantic is very considerably less per person than in the British Isles) stringent regulations exist on some of their largest railways as regards demanding total abstinence while the men are on duty. It is desirable that a similar regulation should be made in England. Meanwhile, we know only too well that every year thousands of accident, casualty, and emergency cases due to alcohol are brought to our hospitals for treatment. Looking at the matter from the merely pecuniary and charitable standpoint, it is obvious that if hospitals could be relieved of these “ created ” demands upon their funds and space, a considerable amount of subscribers’ money would be saved annually, and at the same time the energies of doctors and nurses would be expended in a more satisfactory direction than in healing patients whose accidents are in reality avoidable. Kraepelin describes an investigation by Rudin made to determine how long the intellectual abilities continue to be depressed after the immediate toxic effects of alcohol have had time to pass off. The experiments showed that the effect of a single dose of alcohol taken in the evening persisted until the morning and noon of the next day. First Series (4 papers, i.e. the recording sheet) Second Series (3 papers) . Three ounces of whisky caused 53 per cent more errors than when the brain was under normal conditions. Two cups of tea reduced the errors to 28 per cent less than normal. 1 Wiener klinische Wochenschrift, October 17, 1900. 2 “ On a new Method for Study of concurrent Mental Operations and of Mental Fatigue,” by W. McDougall. The British Journal of Psychology, vol. i. SO ALCOHOL AND THE HUMAN BODY chap. The benefit of tea and the adverse effect of alcohol is thus clearly demonstrated. Before he began the investigation of complex reaction periods, involving greater thought, Kraepelin had always shared the popular belief that a small quantity of alcohol had an accelerating effect on the activity of his mind, enabling him to perform test operations, as the adding and subtracting and learning of figures, more quickly. But when he came to measure with his instruments the exact period and time occupied, he found, to his astonishment, that he had accomplished these mental operations not more, but less, quickly than before, thereby showing that alcohol has a primarily deceptive in­ fluence on the mind, and interferes with the power of forming correct judgments, that it is, in fact, a false witness. Numerous further experiments were carried out in order to test this matter, and these proved that alcohol lengthens the time taken to perform complex mental processes, while by a singular illusion the person experimented upon imagines that his psychical actions are rendered more rapid. Precisely the same delusive effect of alcohol was also noticed by McDougall. This error of judgment probably means that the superior cerebral centres which alcohol progressively paralyses cannot, when immediately under its influence, carry on their work, part of which is to estimate the condition and functional activity of the inferior brain centres. The same phenomenon occurs with ether and other narcotic drugs, so that it is not limited to the alcohol member of that group of substances. As an illustration of this may be quoted one of the common subjective sensations produced by small doses of the ordinary anæsthetics used in surgery, e.g. chloro­ form and ether, namely, that the patient possesses great muscular strength, and feels himself to be making powerful efforts, which in reality are not in any way superhuman and are readily controlled by the bystanders. Drug deception does not occur merely in the intellectual operations of the brain, for we find it also in the emotional sphere; witness the idea which so often pervades the mind of the taker of alcohol, that his company gives pleasure to others and is acceptable to them, whereas in reality this is frequently untrue. The sensations of comfort and well-being which often result from drinking wine, beer, or spirits, are similarly deceptive illusions, for the surrounding comfortless circumstances are not in any way decreased, the only alteration that actually takes place being a deadening of the power of estimating adverse and disagreeable conditions. In a normal state a man strives to improve his surroundings, or else to remove himself and his family from what is bad and unwholesome, but under the illusive influences of alcohol he is ready to rest satisfied and let things remain unaltered and drift, or even take a downward course. 82 ALCOHOL AND THE HUMAN BODY chap. Another familiar deception occurs when the sense of fatigue after exertion is dispelled by alcohol. The idea naturally suggests itself that the exhaustion is genuinely relieved by the drug, which in reality only acts as a deadening agent to normal sensation. The average effects of fatigue, which should induce a man to rest and recuperate, are still present, and have a cumulative influence if proper repose and sleep are not taken. In this respect it is extraordinary to see how many individuals waste their rare opportunities of holiday and recreative repose in taking alcohol, losing thereby all chance of beneficial change and physiological repair. As in this country the consumption of alcohol on bank holidays appears to be slightly on the decrease, it may be hoped that such much-needed intervals of rest taken by the workers are now of more profit to themselves and consequently to the nation. In this connection it is important to point out that nervous debility—or the sense of it—is frequently caused and accentu­ ated by the moderate use of alcohol. Much of the nervous exhaustion of the present day would cease to exist were alcohol eliminated from the dietary of the people. centres, where keen appreciation of discomfort is recorded. Under alcohol the power of appreciating sensations is some­ what lowered; for instance, the feeling of wretchedness or of nervousness before an impending effort is somewhat deadened, and hence the percipient feels cheered and “ more himself,” and it is little wonder that he imagines himself to be stimulated, and has regular recourse to the drug when in difficulty. Most particularly does this occur in women at the climacteric period, or what is known as the change of life. The sense of the special nerve symptoms which render many a life miserable for one or two years during the “ change,” is readily drowned for the time being by alcohol, and it is no wonder, therefore, that women for such reason contract the habit of constantly turning to it, unless they are aided and relieved by proper medical treatment. Again, in the case of acute pain or shock the numbing of the sensory nerve-cells by alcohol makes the patient feel some­ what less ill (e.g. apparently stimulated). In this case the feeling of relief after taking alcohol may be partly due to the dilatation of the cerebral blood-vessels. It ought to be added here that, in spite of the seeming helpfulness of this sedative action on the brain cells, there is always danger in giving alcohol in any form to persons suddenly “taken ill,” for wrongfully administered, the indiscriminate giving of alcohol may induce hæmorrhage from a cerebral blood-vessel. It should be administered only by a doctor, who can diagnose the cause of the attack, and who would hold himself responsible for untoward results. On the other hand, alcohol in all its forms has a prolonged depressant after-stage, and insidiously sets up widespread tissue degeneration, for which reason it is a misuse of terms to call it a stimulant. Alcohol, as we have already pointed out, is a narcotic, and, like other narcotics, possessed of transitory so-called “ stimulant ” properties. (See Chap. I.) 1 Hygiene of Mind, T. S. Clouston, M.D.